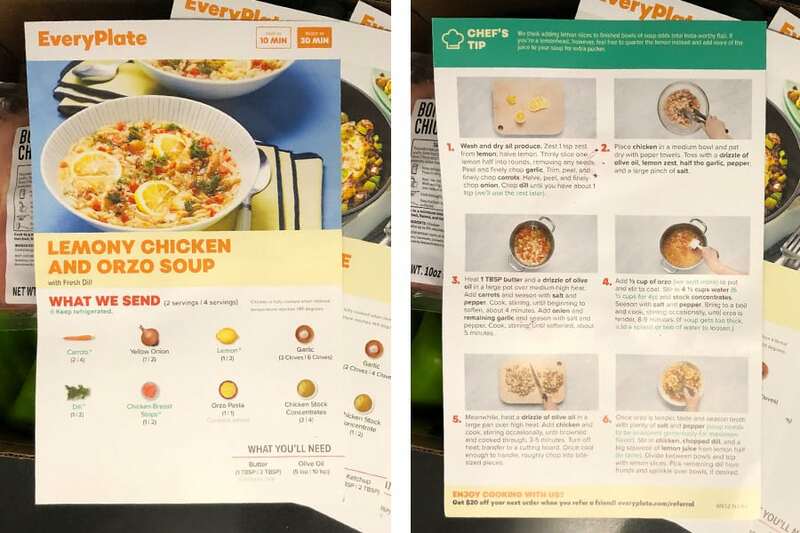 EveryPlate considers themselves to be America’s best value meal kit, which is good news for anyone who wants to eat great without breaking the bank. 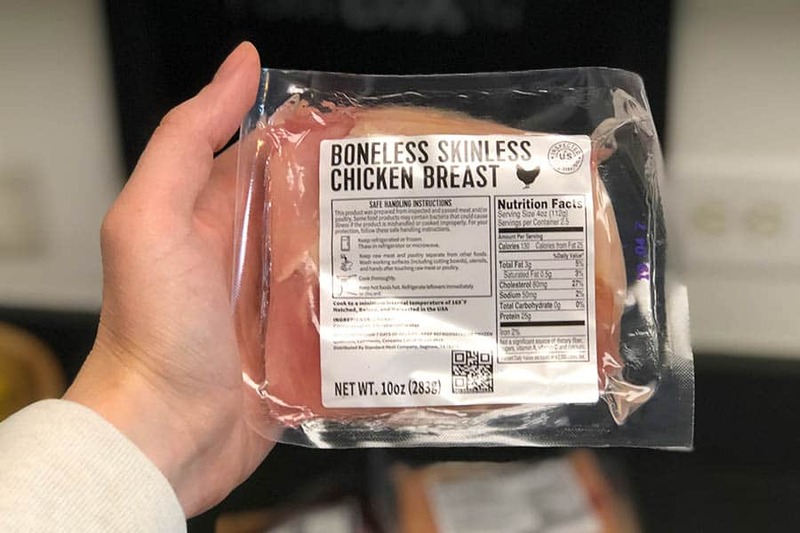 Their meal delivery service sends you fresh, pre-portioned ingredients each week so you can make tasty meals in the comfort of your own home. And the best part? They’ll only cost you $4.99 per meal! Their goal is to help you break the cycle of boring meals. Instead of takeout, you can cook delicious, filling meals with enough servings for two or four people. 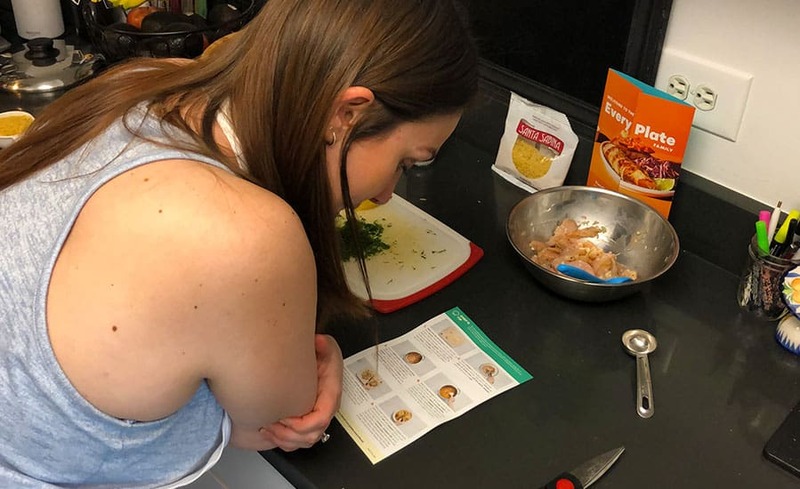 If it sounds like EveryPlate is right up your alley, you’re probably pretty eager to learn more and to purchase your first box. What do you need to know before subscribing? This post has all the important details! To get started, you’ll begin by picking your meal plan. At this time, EveryPlate has two different plans to choose from, which are based on how many servings you’ll need. You can choose the “Dinner For 2” plan or the “Dinner For 4” plan. Dinner for 2 is perfect for a couple, but can work well if you’re solo since you’ll have leftovers to enjoy the next day. And of course, the Dinner for 4 plan is ideal for a family, as their meals are kid-friendly as well. No matter which plan you choose, you will receive three recipes each week. That means you’ll have three less nights to meal plan for. You’ll receive an email every week which prompts you to select your preferred meals. This way, you don’t have to worry about picking what you want to receive in your box. EveryPlate has a rotating menu that changes each week. You’ll have five flavorful meals to choose from, giving you a few options so you can hopefully find something that suits your tastes. You’ll find one “Premium” meal on the menu each week, which is a steak dinner. Selecting this meal comes at an additional price. Currently, EveryPlate is able to ship orders to the majority of the continental United States. The only way to confirm that they can ship to your location is to enter your zip code during the checkout process. Only then will you be notified if they can complete the order and ship to your home. You can also call their customer support team to find out more about delivery. Orders will be delivered between 8 AM and 8 PM on the day of delivery, but times can vary based on your carrier. You do not need to be home in order to accept the delivery, which is perfect if you are away at work all day long. As long as the carrier deems it safe to do so, they’ll leave your package so it’s waiting for you when you return home. You can include additional information in the “Delivery Instructions” if you want your box to be placed somewhere in particular for safe keeping. If you work long nights, we recommend having the box shipped to your work so it can go into the office refrigerator for safe keeping. One thing to keep in mind is that EveryPlate does charge a shipping fee with each order. Shipping costs $8.99, which allows them to keep the prices down on the overall service since they don’t have to cover shipping as well. One bonus of using EveryPlate is that you won’t have to deal with an excess of packaging in every box. In fact, they use less packaging to help you save more money in the end. And not only that, less plastic packaging makes things more eco-friendly for our planet. Speaking of eco-friendly, the packaging is recyclable as well. The boxes and separators are 100% curbside recyclable. The gel ice packs can be cut open and drained into the trash. Then, the liner can be recycled. For the box liners, you simply need to cut the top off of the plastic film, dispose of the cotton interior, and then recycle the film. 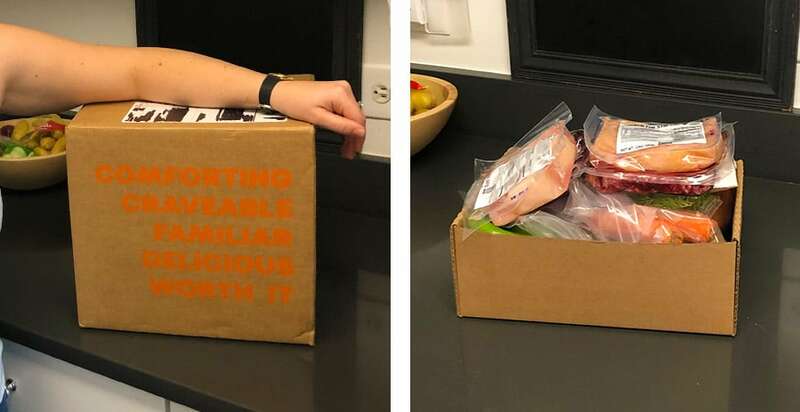 Another great thing about EveryPlate’s packaging is that because less is used, the box itself is much smaller, lighter, and easier to carry than many other meal kit boxes. One negative aspect of them using less packaging is that there is less insulation and padding within the box. Because of this, we recommend unpacking your ingredient and putting them in the refrigerator as soon as you receive your box. High-quality ingredients are really what makes a dish stand out. EveryPlate sources their ingredients from a variety of suppliers, which can vary by week and region. When choosing suppliers to work with, they mention on their website that their top priority is always to get to know them first in order to make sure they pass along the highest quality ingredients to their customers. Unfortunately, EveryPlate won’t be ideal for someone looking for meals made from organic ingredients that have been sourced from sustainable farmers. While you don’t need to be home to receive the box, you will want to unpack it as soon as possible after its arrival (as we recommended above). To ensure your ingredients stay fresh, EveryPlate recommends storing produce, proteins, and dairy in the refrigerator immediately after you unpack the box. At under $5 per meal, you may think that cooking EveryPlate might be more involved or tougher than the other “big” meal kits on the market. However, we found the opposite to be true. Cooking our EveryPlate meals was surprisingly simple. 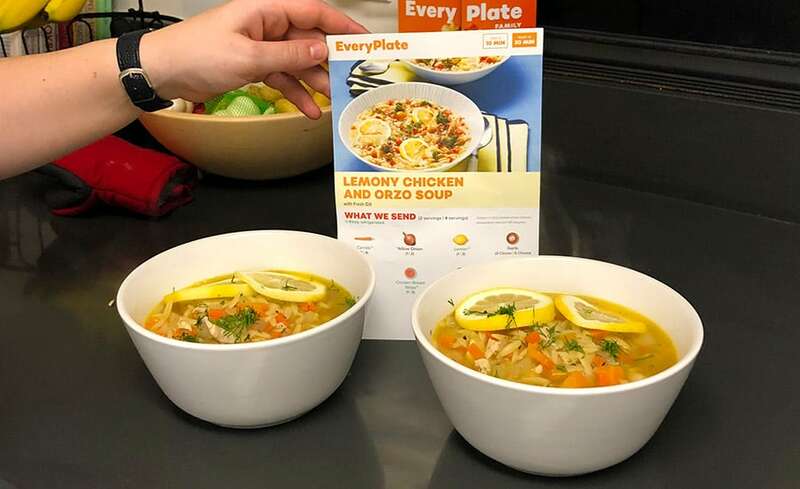 In our initial video review of EveryPlate, we cooked up the Lemony Chicken and Orzo Soup recipe. Because it was a soup, mostly everything went into one big pot that simmered until cooked. The only other cooking utensil we needed out was a pan to cook up the chicken before putting it in the soup. That ease of cooking is consistent with every meal EveryPlate sends you. They provide you with just about everything you need to prepare a home-cooked dinner. You’ll receive the recipe and all the main ingredients it requires. However, you need to have basics on hand like salt, pepper, butter, and oil. They allow you to view the recipe online when picking your meals so you’ll know if there are any extras you need to pick up for the week. You can also see the steps required for each meal so you’ll know what you’re getting into before choosing your meals. Since the ingredients are already pre-portioned, you don’t have to worry about measuring things out. This helps to cut down on prep time so you can get dinner on the table faster than ever, which your whole family is sure to appreciate. In general, cooking an EveryPlate meal will take anywhere from 30-45 minutes, depending on the dish. We found that we were able to cook the meals in less than 30 minutes (including prep time). You will want to make sure you have kitchen essentials like a pot, pan, baking sheet, knife, and cutting board. In addition to the essentials, there are recipes that require some more intermediate cooking utensils such as a zester, peeler, potato masher, whisk, and strainer. As long as you have all of these on hand, you’ll be good to go. The Honey-Glazed Chicken with Chipotle Mashed Sweet Potatoes and Zucchini is definitely a favorite. We actually had it last night for dinner (March 25, 2019). Cooking it was a breeze. We just had to find an alternative tool to mash the sweet potatoes since we don’t own a masher. It’s a filling meal that definitely won’t leave you hungry. What was interesting about the meal was the tasty honey glaze on the chicken. I would’ve never guessed honey and chicken would go so well together! Plus, the sweet potatoes are made incredibly flavorful thanks to the addition of chipotle seasoning. And finally, another must-try dish is the Lemony Chicken and Orzo Soup with Fresh Dill. This is the meal you can see us cook in the video review above. This soup is unbelievably light and refreshing, but it still leaves you feeling full and satisfied afterwards. It’s packed with chicken, carrots, orzo, and fresh dill so there’s plenty of flavor in here. We actually ended up having another whole portion after cooking it, which we ate the next day for leftovers! To help you make the most informed decision possible, we’ve broken down the top pros and cons of EveryPlate below. Generous portion sizes. As noted above, we ended up with a whole other meal worth of leftovers when cooking the Lemony Chicken and Orzo Soup with Fresh Dill. Very low price per serving. At under $5 per meal, EveryPlate is one of the least expensive meal kits currently available for purchase. Delicious meals. All of the dishes we cooked came out very well. Good meal kit for all cooking skill levels. The recipes they send are not too hard or too simple. Not a lot of meal variety. They only give you the option to choose from 5 different meals per week. Packaging might be too minimal. Upon unboxing, we noticed there was little padding to prevent food from moving around during transit. There are no special meal plans. If you stick to a special diet (e.g. vegan or gluten-free) EveryPlate is not the best meal kit for you. They charge for shipping. At $8.99, this is one of the higher shipping costs we’ve seen. Because EveryPlate aims to keep their meals at affordable prices, you can expect to pay $4.99 per serving. 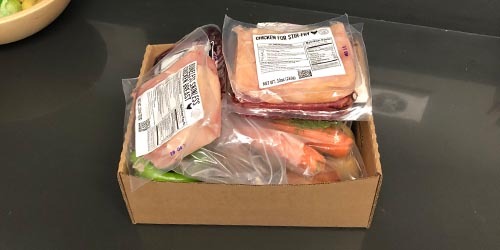 It’s certainly a lower cost than many other meal delivery services can offer, which is a plus for anyone looking to save money. You will also be charged $8.99 for shipping, so you’ll want to keep that in mind when considering the overall cost. If at any time you need to take a break from your EveryPlate service, you can easily skip weeks. You can also cancel the service any time you need to, so you’re never locked into a long-term subscription. For anyone looking to make delicious meals at home without blowing their budget, EveryPlate is really worth considering. You’ll be able to choose from a new menu of five chef-crafted recipes each week, providing you with plenty of variety. This way, you’ll never get bored and you won’t fall into a rut of eating the same old things. 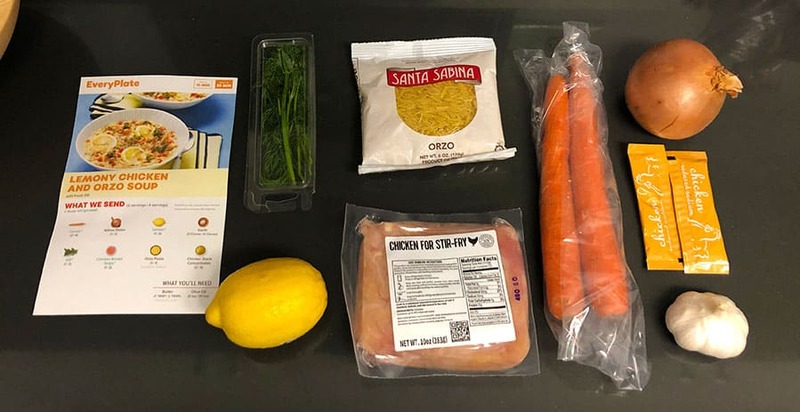 We were pleasantly surprised at just how much you get out of this meal kit for the price. If you have any questions about EveryPlate, leave a comment below and we’ll get back to you as soon as possible!